Sharing a very simple idea to celebrate our most holy mother and Queen of heaven. After taking off the wrapping paper, gently carve a crown-shape in the top layer of the wax. 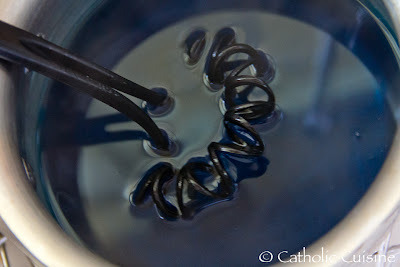 You don't need to press very hard and the wax pops right out, leaving the paper tab in place underneath. Place on a platter, with crackers, for serving. 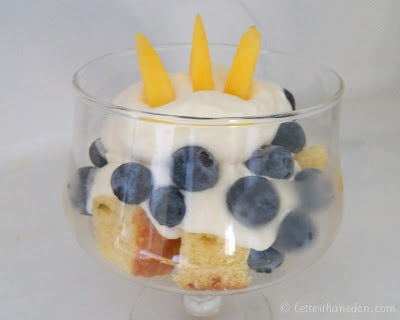 If you have a crown-shaped cookie cutter, you could add some fruit! Father, you have given us the mother of your Son to be our queen and mother. With the support of her prayers may we come to share the glory of your children in the kingdom of heaven. 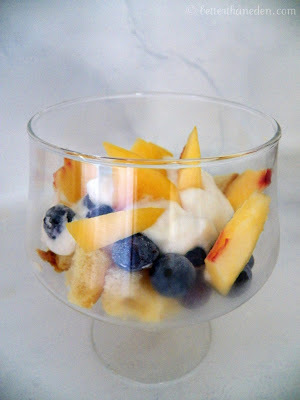 The following recipe for Blueberry Peach Parfaits was submitted by Mary from Better Than Eden. Thank you Mary! I put together a super simple dessert for the feast day of the Crowning of the Blessed Virgin and thought I'd share it in case you were wanting a jumping off point or some inspiration for your own festivities! 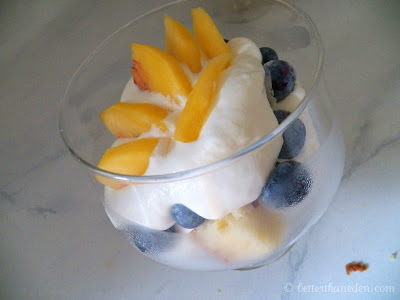 The great thing about parfaits and trifles is that there are no hard and fast rules and they are so versatile and yet still look fancy and are a special treat. This is what I put together from what I had but use what you have and make it work! 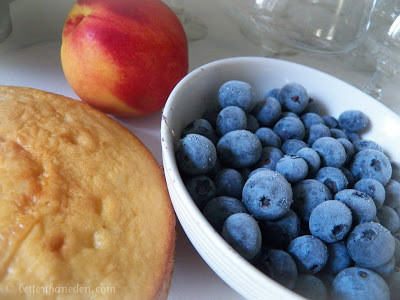 The blueberries represent Mary and the peach her golden crown. The whipped cream symbolizes the heavenly clouds and I suppose you could even have the cake represent that she is fully human and still intercedes for us here on earth below. 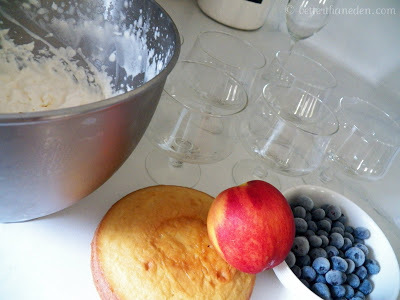 Assemble your glasses or use a trifle dish. 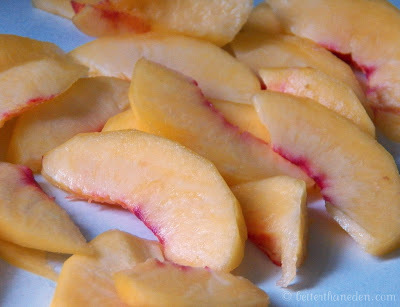 Peel your peach and slice thinly. Cube up your cake into bite size pieces. 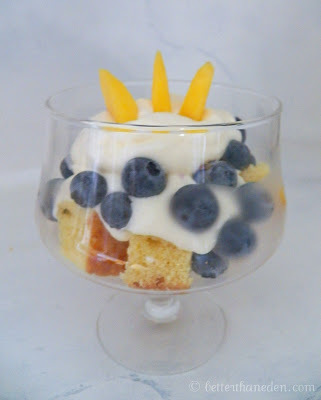 Then just layer it all together: cake, whipped cream, blueberries, whipped cream, and use several slices of your peach for Mary's crown. Simple, simple. and an abstract version. No rules, remember? Mary, you who are mother of our King and queen of heaven, pray for us! The following recipe was submitted by Susan from Sole Searching. Thank you Susan! 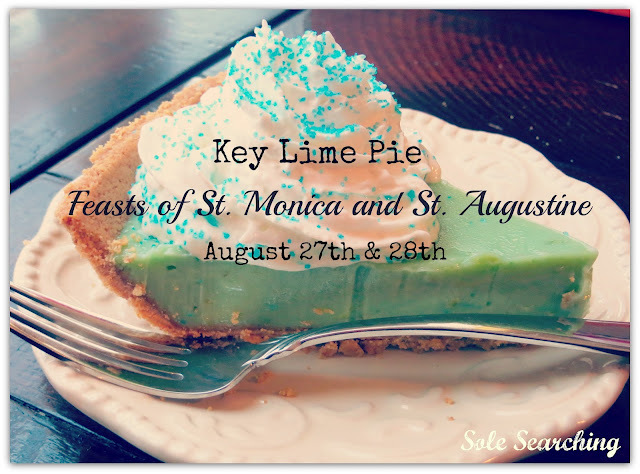 - The pie itself represents the sea of tears (blue color, round shape) shed by St. Monica for her son Augustine, that he may know Christ and so be converted by His love. - The whipped cream with blue sprinkles represents heaven. St. Monica's sacrifice and prayers were honored by our Lord, and St. Monica and St. Augustine live on in eternity in heaven with Christ. 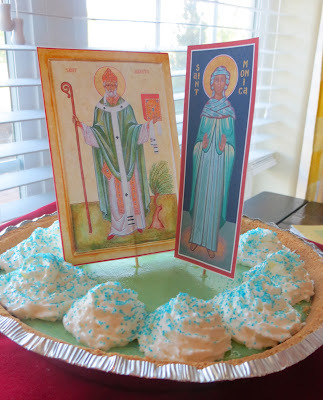 - The icons placed in the center of the pie were there to give the children a visual of the two saints while I read to them their story. Mix ingredients together in a large bowl. Press into an 8 inch pie plate and bake until golden, about 12-13 minutes. Remove from oven and cool on a wire rack. Reduce oven temperature to 325. Combine milk, egg yolks, lime juice, food coloring and zest in a medium sized bowl and whisk together until blended. Pour into prepared, cooled crust. Bake until the center is set, but still quivers when the pan is nudged, about 15-17 minutes.. Let cool completely on a wire rack. Refrigerate for 2-3 hours or until chilled. 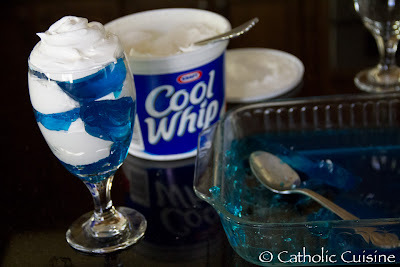 Top with whipped cream, homemade or Redi-Whip, and garnish with blue sprinkles before serving. *I have used the bottled key lime juice as well as the fresh juice of regular limes and the pies have turned out just fine. The Solemnity of the Assumption, which is a Holy Day of Obligation, is coming up on August 15th! 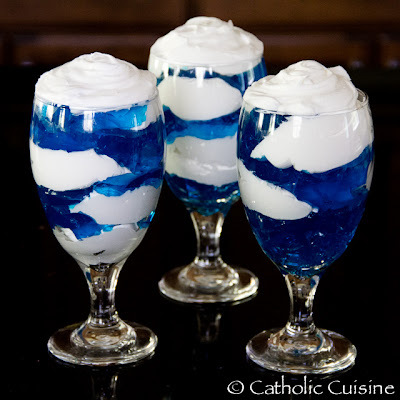 These Assumption Parfaits, adapted from Yummy Finds, would make a simple and fun treat to celebrate the feast! 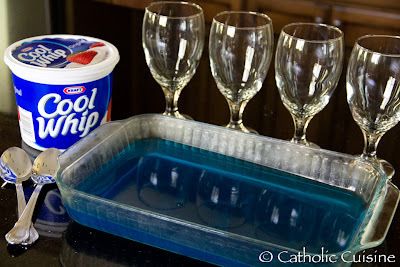 To make these all you need is a box of Berry Blue Jello, Cool Whip, and Glasses. 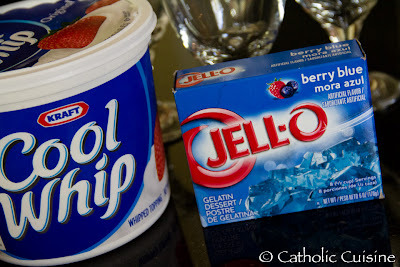 Prepare the Berry Blue Jello according to the directions on the package. 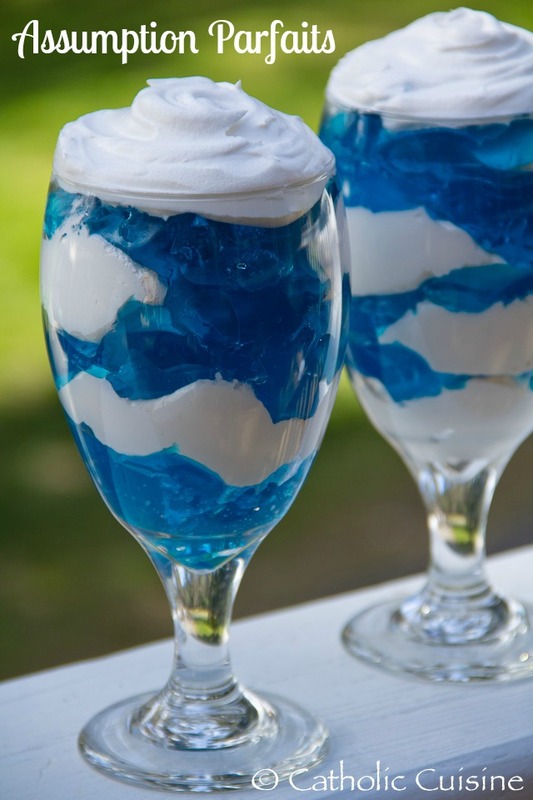 Layer spoonfuls of Berry Blue Jello and Cool Whip in narrow glasses to create the sky and clouds! Be sure to alternate where you place the cool whip “clouds” so that you get a nice staggered effect. 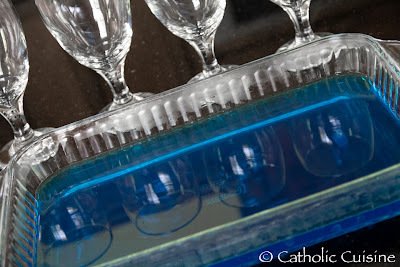 You can see the rest of the pictures from our celebration here.